Q-Connect Envelope 381x254mm Pocket Self Seal 115gsm Manilla (Pack of 250) 8312 Pack of 1 Q-Connect Heavyweight Manilla Envelopes. Tear-resistant basket weave manilla protects your contents and withstands rough handling. Ideal for bulky documents and catalogues. 115gsm manilla with a self-seal flap. 381mmx254mm. 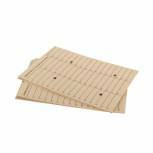 Q-Connect Envelope 381x254mm Pocket Self Seal 90gsm Manilla (Pack of 250) X1087/01 Pack of 1 Q-Connect manilla envelopes. Budget envelopes. Manufactured from 90gsm manilla with a self-seal flap. 381mmx254mm. 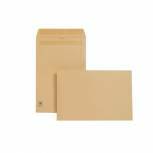 New Guardian Envelope Gusset Peel and Seal 381x254x25mm 130gsm Manilla (Pack of 100) M27466 Pack of 1 New Guardian gusset envelopes. Extra strong envelopes with peel and seal closure and expanding 25mm block bottom gusset ideal for mailing out catalogues and other bulky items. Weight - 130gsm. 381x254x25mm. 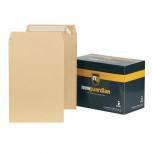 New Guardian Envelope 381x254mm Pocket Peel and Seal 130gsm Manilla (Pack of 125) E23513 Pack of 1 New Guardian Envelopes. 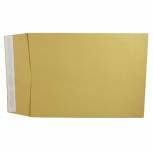 Top quality manilla envelopes with peel and seal easy open closure. Weight - 130gsm. 381 x 254mm. 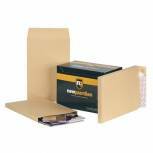 New Guardian Envelope 381x254mm Pocket Self Seal 130gsm Manilla (Pack of 250) J27403 Pack of 1 New Guardian Envelopes. 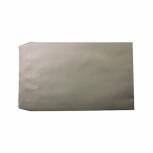 Top quality manilla envelopes with press seal closure. Weight - 130gsm. Size 381mmx254mm. 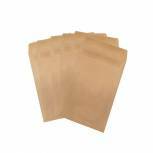 Envelope 15x10 Manilla Peel Seal 90gm Pack 250 Pack of 1 Extra strong mediumweight manilla envelopes for everyday mailings. Comprehensive range of sizes and closures. A 90g/m2 envelope with the strength of a 115g/m2 envelope. 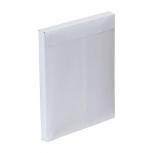 Plus Fabric Gusset Envelope 381x254x25mm Peel and Seal 120gsm White (Pack of 100) H28866 Pack of 1 Plus Fabric gusset envelopes feature a strong closure for security. 120gsm for added strength. Expanding 25mm gusset. 381 x 254mm x 25mm. Peel and seal white. Pack 100. 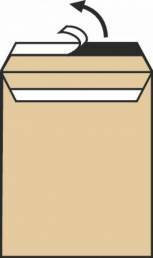 Q-Connect Envelope 381x254mm Internal Mail Resealable 200gsm Manilla (Pack of 100) KF76979 Pack of 1 Manilla envelopes for internal mail. Punched holes show if envelope is in use. Reusable self-seal flap. Printed boxes for addressee. 381 x 254mm. Suitable for A4 and larger documents. Supplied in a pack of 100.